Can I bring younger siblings with my child? Classes are age specific, but apart from the pre-school groups, younger siblings are always welcome. I run some 'mixed' groups with this in mind and younger children still enjoy over two sessions. What is the usual size of groups? I prefer to take no more than 18-20 in a group, so that the children can feel 'known' and I am able to give them the attention they deserve. What is the youngest/oldest age? Children generally start at about 6 months and can continue until they start school. I also take children in their Reception year in my pre-school group. It costs £4.70 per class for one child. Two children over six months from the same family cost £6.70. The pre-school group cost £6.00 per session. Please speak to me regarding extra siblings. Fees are made payable a term in advance. Terms are generally 10 to 12 weeks. Fees are payable a term in advance. Do you pay if you miss a week? You and your child may not be able to make every session and my policy is that sessions missed, maybe made up at another time. If I have to cancel (i.e. weather conditions etc.) I will credit the next term or reimburse. What if my child won’t sit still? Fiddlesticks is also about the development of your child's concentration and focus. Do not worry if your child finds it hard to concentrate or sit in the circle. Even children who have had excellent concentration, go through phases often linked with their development, when sitting is not what they are about. There is always a knee bounce song or a change of focus to keep their attention. Fiddlesticks keeps to a routine that the children soon become familiar with (even though the songs and programme changes every week). There will always be children who will not sit down, as long as they are enjoying their session and there are ways that this can be accommodated. How can I make the most of the experience? Enjoy your time with your child or children. Don't worry if they are not doing the same as the other children. Make friends with the others, Fiddlesticks is about having fun. When do I start paying for my younger child? Payments for the younger child start in the term after they turn 6 months. However when a younger child is attending a session for older children, I prefer to wait until you and I agree that they are benefitting. The first session is always a free trial. I have a risk assessment and Health & Safety Policy, plus Child Protection Policy. 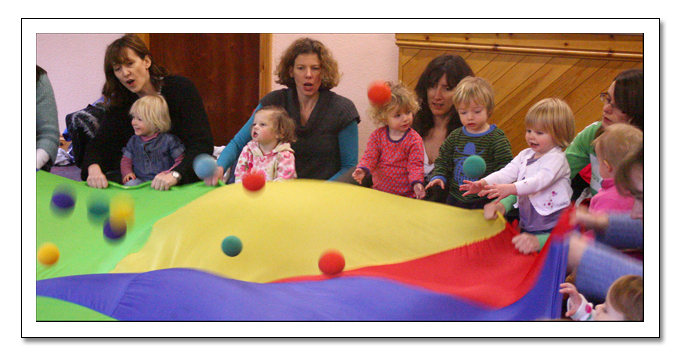 Sessions for pre-school and nursery organisations, including Reception, start at £20 per half hour session.